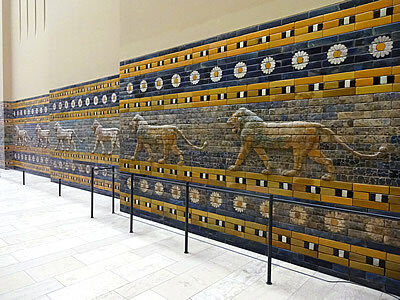 Berlin has some of the greatest museums in the world; especially the Pergamon Museum with the fabulous Pergamon Altar and Ishtar Gate from Babylon..
Six-curled, lion-taming hero (plaster cast), the original is from the Palace of Sargon II, 721-705 BC. 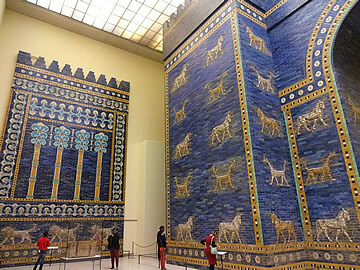 In 2013 this was our primary target, to see the Pergamon Altar and the celebrated Ishtar Gate. All photographs 2013 unless otherwise noted. 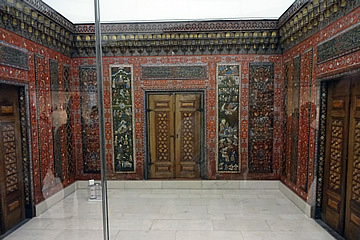 The museum hosts three collections: Collection of Classical Antiquities, Museum of the Ancient Near East, and the Museum of Islamic Art. 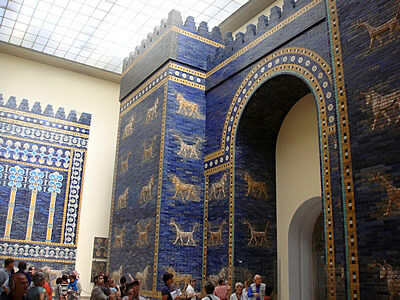 In 2013 the museum was hosting an exhibition on Uruk, the famed Mesopotamian city which dominated the region for over 2000 years from around 4000 BC. 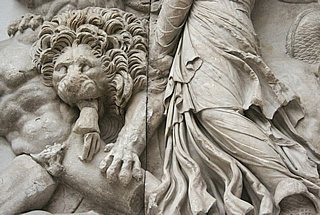 At the entrance was a fabulous relief of a lion-taming hero. Though only a plaster cast of the original, which is in the Louvre, it was still impressive. 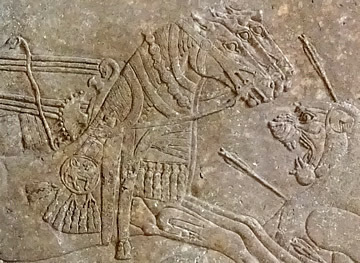 The lion-taming hero, as dictated by tradition, had six curls in his hair and is one of the oldest and most enduring of the subjects of Ancient Near Eastern art. 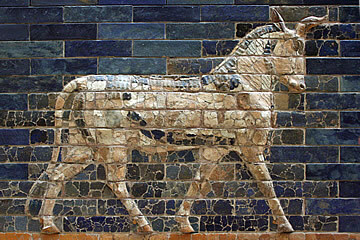 He is often associated with the legendary King Gilgamesh of Uruk. 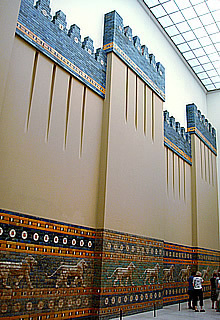 The relief was originally part of the outer facade of the throne room inside the palace of the Neo-Assyrian ruler Sargon II. 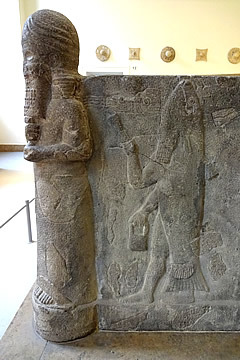 Segment from the facade of the Inanna Temple built by the Kassite ruler Kara-indash; Uruk, c 1413 BC. 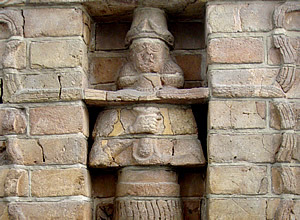 A small temple of fired brick from Uruk has niches holding male and female deities, life-giving water pouring onto the ground from the vessels in their hands. 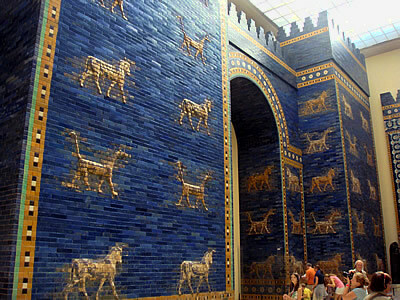 It was built by a Kassite ruler, Kara-indash,whose people had come into Mesopotamia from the east around 2000 BC. 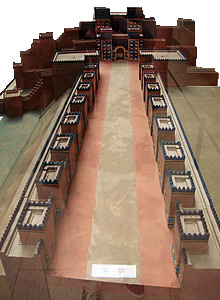 The temple originally stood on a platform 22.5m x 17.5m. and the reconstructed walls in the museum use a great many original brick fragments. 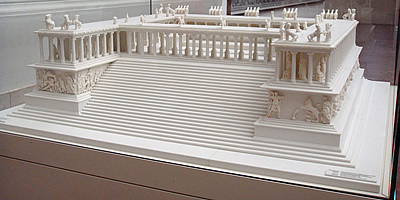 Model of Pergamon: front is the huge Altar, the white mass of the Greek Theatre slopes down the hillside; above, facing out over the theatre, is the Temple of Trajan within a colonnaded courtyard; centre is the Temple of Athena. 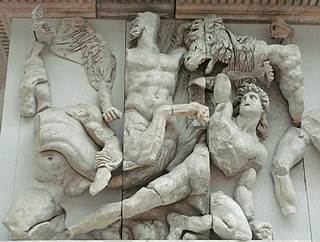 The walls surrounding the steps leading to the fire court above are decorated with a high relief frieze depicting the battle between the Giants and the Olympian gods. 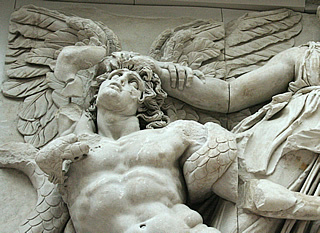 The giants were believed to be partly formed of snakes, hence the preponderance of these in the frieze. The sense of violent movement achieved in the sculptures is startling. The fragments were excavated from the acropolis towards the end of the nineteenth century by the German archaeologist Carl Humann. 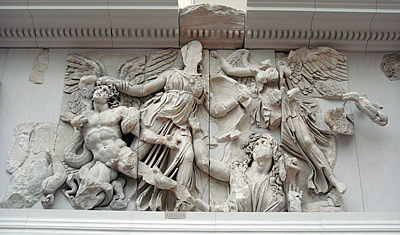 All fragments of the frieze were brought back to Berlin. 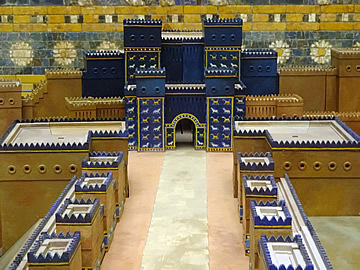 A replica of the front part of the altar, including the fire court, was eventually created, incorporating the original fragments. 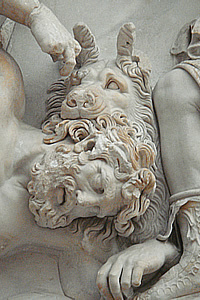 A dog of Artemis, the goddess of the hunt, kills a giant with a bite to the neck. 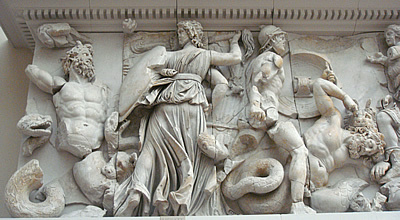 The court of the fire altar was also decorated with a carved frieze, this one telling the story of Telephus, the legendary founder of Pergamon and son of Hercules and Auge, a priestess of Athena. 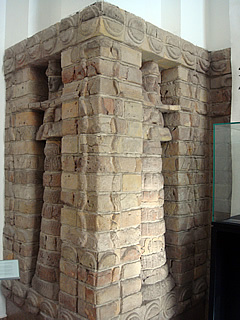 Fragments of the frieze are also displayed in the reconstructed fire court of the altar in the museum. 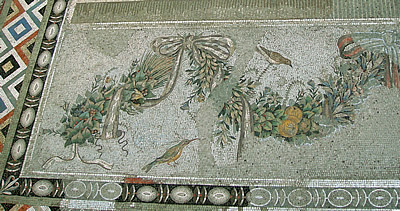 On the floor is an incomplete mosaic showing garlands of fruit, leaves and berries with small birds, and a beautiful panel with a parrot. Sacrificial beasts were slaughtered at the foot of the altar, their organs burnt as offerings in the fire altar, the remainder distributed. 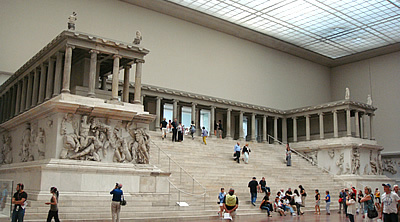 In 2018 the Pergamon altar was undergoing renovation. 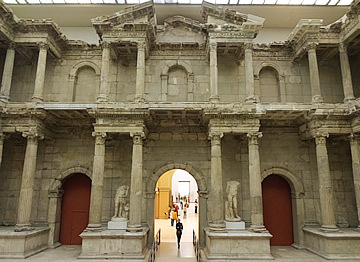 As a consolation the Pergamon Panorama by Yadegar Asisi and some 80 artefacts are displayed in a separate building. 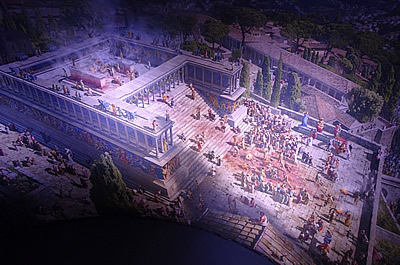 The panorama is an impressive 360 vision of the city in 129AD during the festival of Dionysus when Emperor Hadrian visited Pergamon. Greeks first settled here in the 2nd millennium BC, but the city only really came to prominence towards the end of the 4th century BC. 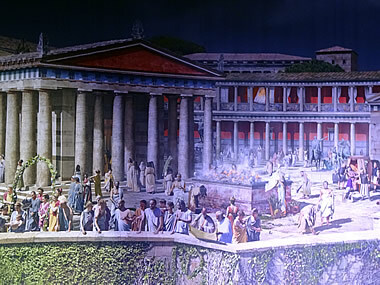 It was at its height during the reign of the Attalids in the 2nd century BC when the famous Great Altar was built. 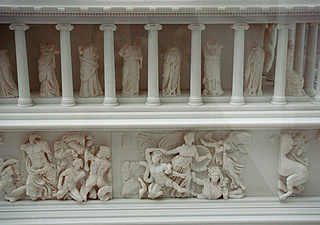 The sculpture frieze around the altar was once brightly painted. 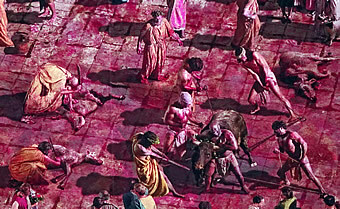 Butchery at the foot of the Great Altar. 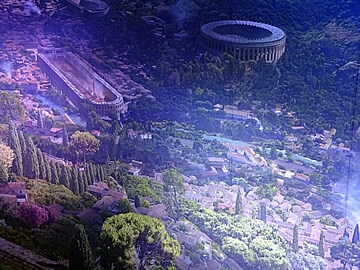 In the plains below the acropolis are the homes of the populace and structures such as the stadium and amphitheatre. 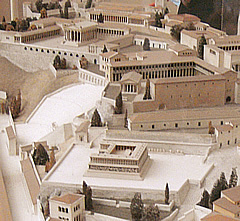 The sanctuary for the Roman Emperor Trajan and Zeus Philos stood at the highest point of the acropolis. Sanctuaries stood at the high point of the acropolis, above the massive Greek Theatre, visible for miles around in the plains where the Roman town was situated. 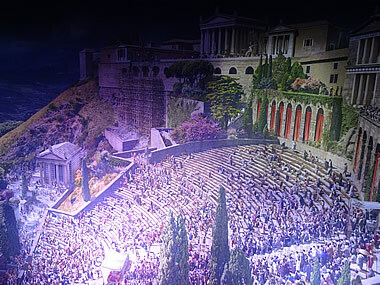 The Greek Theatre, set in the steep hillside below the sanctuaries, could seat 10,000 spectators. 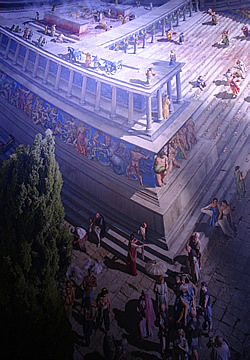 The small temple, centre, left, is the Temple of Dionysus - the god was closely associated with theatre. Artisans area with a sculpture workshop in the foreground. Between the Great Altar and the sanctuaries is an area filled with artisans including a sculpture workshop and a parchment workshop. 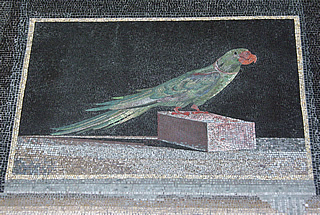 Pergamon was famous for its parchment produced from animal skin. 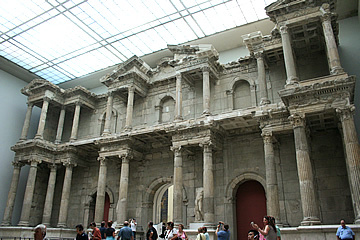 The Greek word for parchment is pergamene - named after the city. 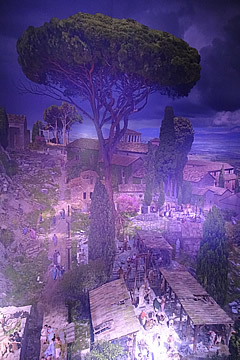 The panorama is displayed under a changing light - we found dusk and night seemed to last much longer than day! 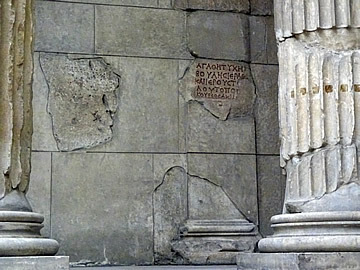 Behind the two central columns of the Market Gate is a Greek inscription marking the place of a trader. We had also visited Miletus on the Aegean coast, a Greek trading port which declined after the sea receded. 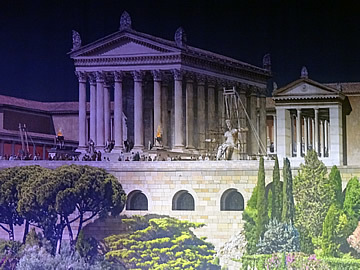 In the museum they have the reconstruction of the massive Market Gate, the north entrance to the South Agora. 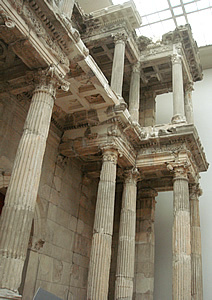 It dates from the second century AD but collapsed in an earthquake around 800 years later. It includes significant amounts of modern material, but gives an excellent impression of the monumental architecture of the city. 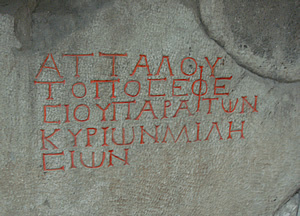 On the side of the Market Gate entrance is this piece of ancient graffiti which declares that this spot is where the Ephesian, Attalos, has his stall. 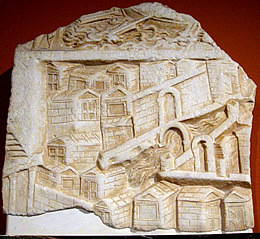 Relief depicting a river town, 150-200 AD. 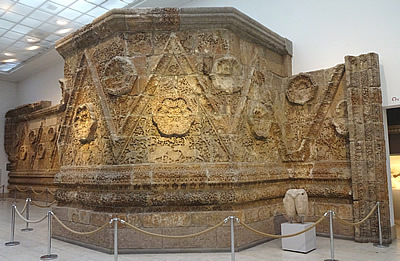 Neither Miletus nor Babylon, just something I liked for its naively evocative carving. 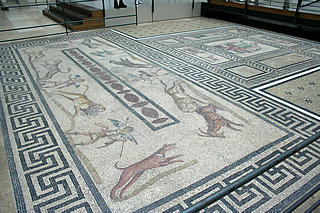 Another treasure form Miletus is the Orpheus Mosaic - a beautiful mosaic floor from the dining room of a Roman private house. 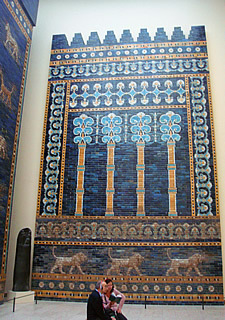 The Processional Way leading to the Ishtar Gate. 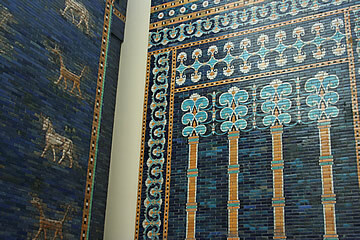 The monumental Ishtar Gate is so magnificent and impressive that we spent a good half hour looking at it both times we visited. 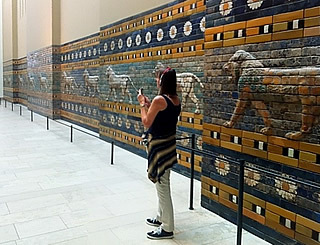 Dating from 600 BC it was designed to intimidate and inspire awe in those approaching the city of Babylon along the Processional Way. The original was a double gate, this smaller outer gate led to a much larger inner gate. 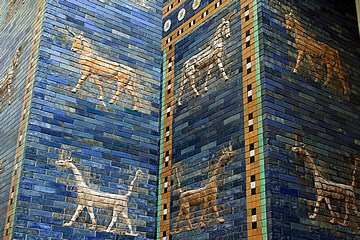 The massive Ishtar Gate is also covered in beautiful blue glazed bricks and panels with animals: dragons which represent the kingdom's god, Marduk, and bulls which represent the weather god Adad .3 Huge cedar doors covered in bronze closed the entrance at night. 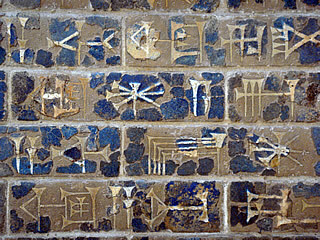 Cuneiform writing on the walls of the gate, part of Nebuchadnezzar II's Inscription. 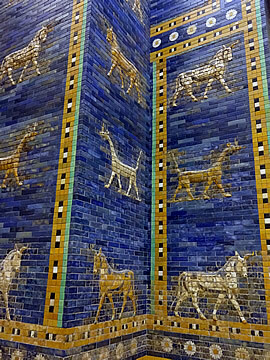 "I [=Nebuchadnezzar] laid the foundation of the gates down to the ground water level [...] and had them built out of sheer blue stone, on which bulls and dragons were elaborately painted. [...] I set up wild bulls and furious dragons in front of the gates and thus magnificently adorned them with luxurious splendour for all mankind to" behold in awe. The translation actually ends "look at in surprise" but I think "behold in awe" is much better and was the 2013 interpretation. Water basin from Ashur, Assyria; 704-681B.C. Detail from Lion Hunt panel, Nimrud, 883-859 B.C. 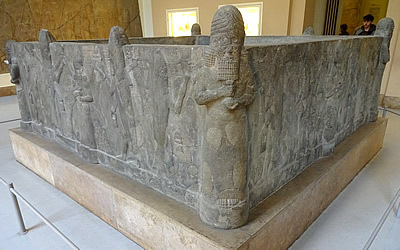 A huge water basin from the Temple of Ashur in the ancient Assyrian city of Ashur is decorated with water gods holding overflowing water jugs, and priests in fish costume. 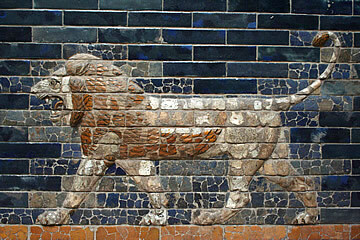 There is a very good Lion Hunt panel from the reign of Ashurnasirpal II (883–859 BC) at the great city of Nimrud. 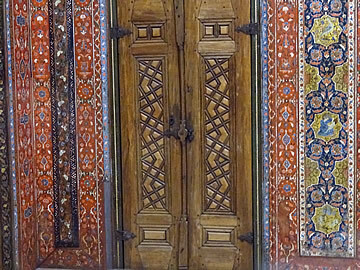 The beautiful painted Aleppo Room was once the reception room of a rich merchant in the 17th century, a wonderful example of Islamic art. There is also a very beautifully designed 16/17th century carpet from India, possibly Agra, over 7m long. 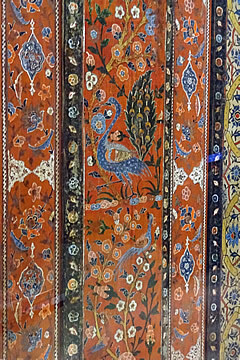 16/17th century carpet from India. 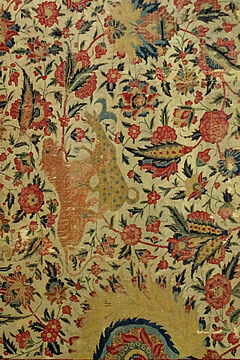 Detail, 16/17th century carpet from India. All images below are from 2018. 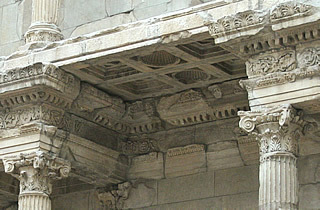 Facade, Palace of Mshatta; 8th century. 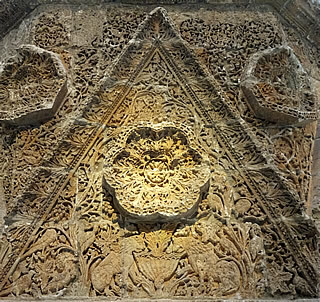 The intricate facade of the Palace of Mshatta was given to Kaiser Wilhelm II by the Ottoman Sultan 'Abd al-Hamid II. 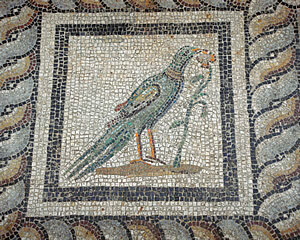 Originally it was part of the palace located around 30 km south of the Jordanian capital, Amman. Building probably began during the very short reign of Umayyad caliph al-Walid II, murdered after little more than a year on the throne in 744 AD. 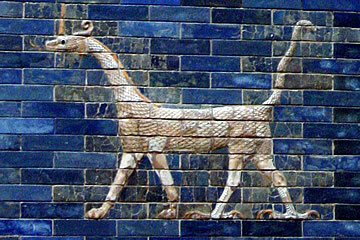 The imagery includes depictions of animals and mythical beasts, except at the point where the facade stands in front of a mosque where such imagery is forbidden. 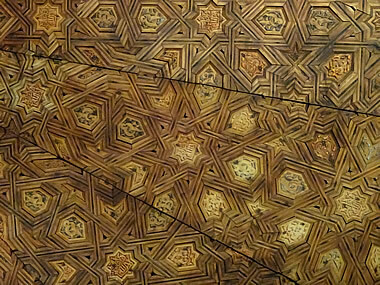 Detail, wooden dome from the Alhambra. 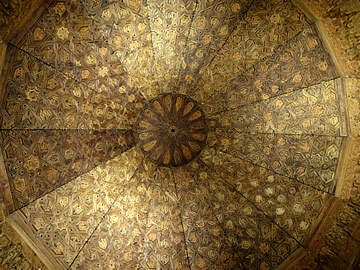 An intricate wooden dome was once part of the Alhambra in Spain, coming from the Palacio del Partal, one of the oldest parts of the Alhambra complex dating from the early 14th century.